Creating an Interstitial Page — Slugline. Simply Screenwriting. Some screenplays begin with a special page that contains only a quotation or other text meant to set the context for the story. The Hurt Locker, for example, starts with a page featuring two quotations about mankind and war. You can do this in Slugline with manual page breaks, but for now, this means the first actual page of your screenplay will then be numbered as page 2. In the world of screenplays, page count matters, so this is kind of a bummer. We have plans to make this work better, but for the time being, there’s a pretty easy workaround that takes advantage of one of the post powerful and underestimated apps on the Mac: Preview. Preview isn’t just for viewing images and PDFs. It also has many powerful editing abilities, including re-ordering pages, and even inserting pages from one document into another. 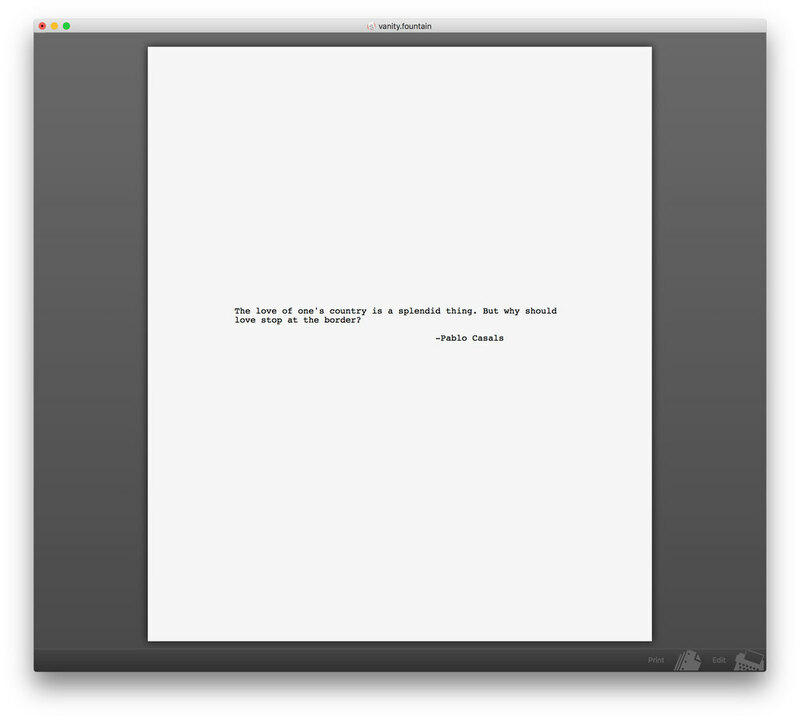 So, to create an interstitial page, just save two PDFs — one of your screenplay, and another with just the special page. Then open both, and drag the single page into the thumbnail pane of the screenplay, inserting it exactly where you want it. If Preview opens without the Thumbnails visible, reveal them by choosing View → Thumbnails. When creating the document for the interstitial page, you’ll probably want some white space above the text to center it vertically on the page. You can create this with a few carriage returns, but to make sure Slugline prints those lines as intentional white space, add 2 spaces to the very first line of the document. This technique can also be used for adding a fancier title page, with whatever fonts or imagery you like. 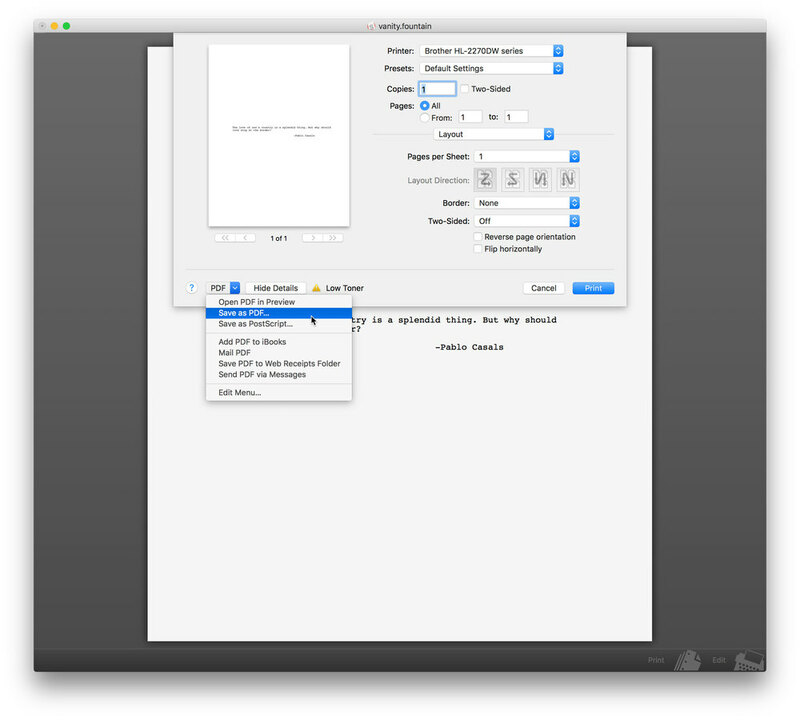 Create the title page of your dreams in any app that outputs PDF, then insert it according to the above instructions. We’ll make this process much easier in a future version of Slugline, but for now, this is a powerful way to customize your PDF screenplays.